Have you heard of the HEART framework? When I stumbled across it, I couldn’t get it out of my head. I recited the acronym on my bike ride home. I scribbled it on whiteboards around our conference rooms. I was head over heels. HEART is a framework for measuring and improving user experience, and each letter stands for a different user experience metric: Happiness, Engagement, Adoption, Retention, and Task Success. And what I find so appealing about HEART is that it pins the discipline of user experience to revenue-driving metrics—a connection I previously struggled making. 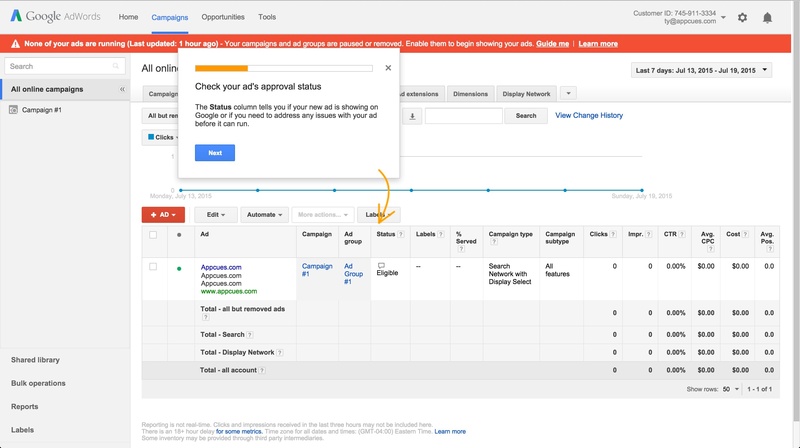 What is Google's HEART framework and how does it help UX? The framework was devised from Google user experience research after internal teams realized that UX wasn’t being measured effectively. At the time, there were plenty of effective ways to measure user experience on a micro level—such as time-on-task and task completion rate—but UX designers weren’t being held to the macro business metrics that they directly influence. 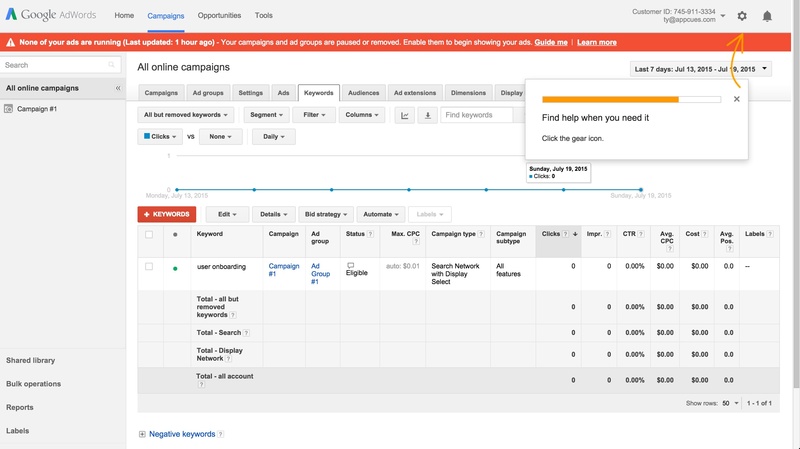 So Google developed HEART as a new framework for measuring user experience. A measure of users' attitudes or satisfaction. Happiness is most often measured by user surveys and NPS responses. The level of use an average user is getting from your product. Engagement is most often measured by looking at in-product analytics including time spent in-app, number of sessions, or number of shares. The percent of users that adopt your product after signing up (user onboarding), and/or the percent of users that adopt a specific feature of your product. Adoption is also measured by in-product analytics, but this time looking at upgrades to new versions, new subscriptions, and new purchases. The rate of total users that are still returning to the product. Retention is most often measured by looking at churn. The ability for users to complete a task. Task success can be measured by looking at error rates and in-app task completion. The HEART framework is great because it encompasses both micro and macro measurements to help determine the impact of a product’s user experience. Retention has the most direct relationship with current and future revenue, while the other UX metrics have influence over value. After reading about HEART and its origin from Google’s research, I invested four weeks of my own research on how Google drives user experience within the framework. Happiness is a calculation of emotion and because of that it’s hard to optimize for. 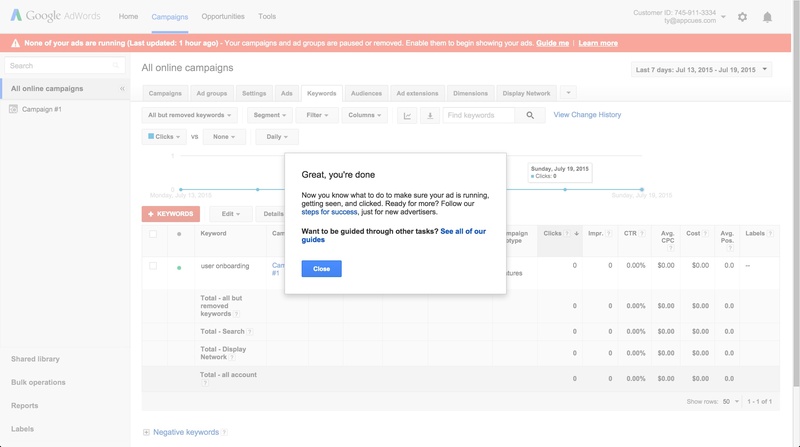 But it can be easy to measure through NPS scores and user surveys. By measuring happiness over time, you can better understand if the direction of your product is pleasing to users. By coordinating satisfaction surveys with your latest redesign or feature rollout, you can interpret the data to correlate with the change. 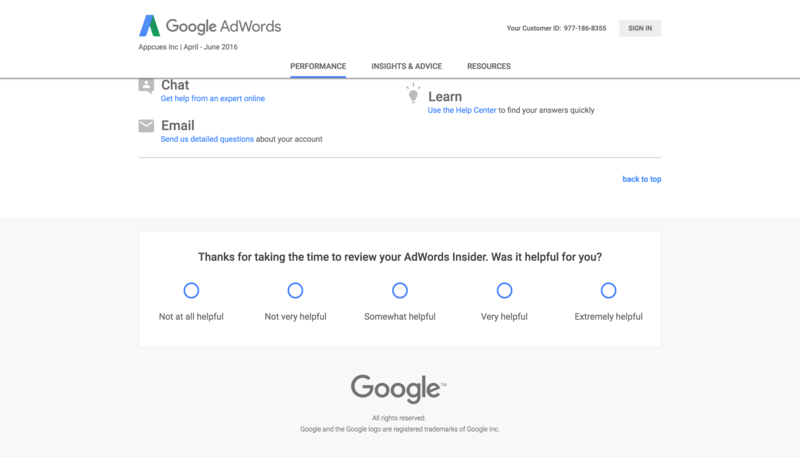 By embedding an NPS style survey to the footer of this page, Google makes their ask contextual with the product itself. This in-product survey most likely captures more accurate and thoughtful feedback than one that comes via email. 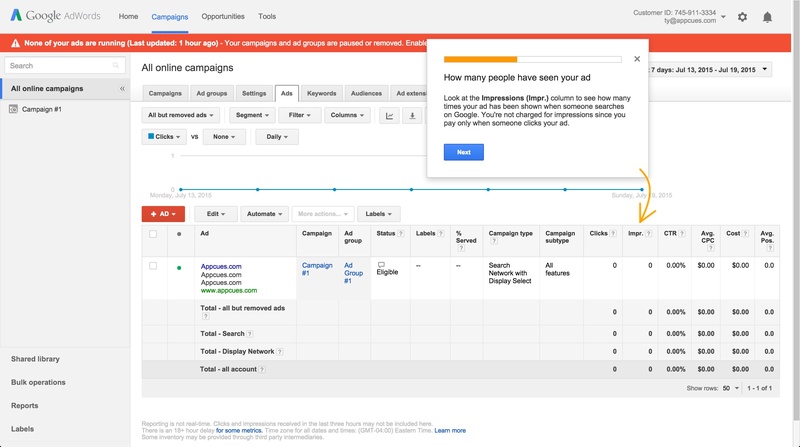 With this data, Google can better determine how iterations impact their users’ happiness. The hope here is to see more and more promoters of their product. If that isn’t the case, Google has been known to scrap products entirely. Remember Google Reader? Google defined user engagement in their original user experience research report as, “the user’s level of involvement with a product.” The way I like to think about engagement is as a measure of habit or habitual usage, which comes after a user adopts a product—remember, adoption is the A in HEART. Creating and increasing habitual use of a product is hard to do in a distracted world. Google, however, is a master of habit creation. To prove it, just take a second to consider how many Google products you use regularly. I’m certainly not the only one who uses Gmail, Docs, Drive, Cal, and Analytics in my Chrome browser several times a day. 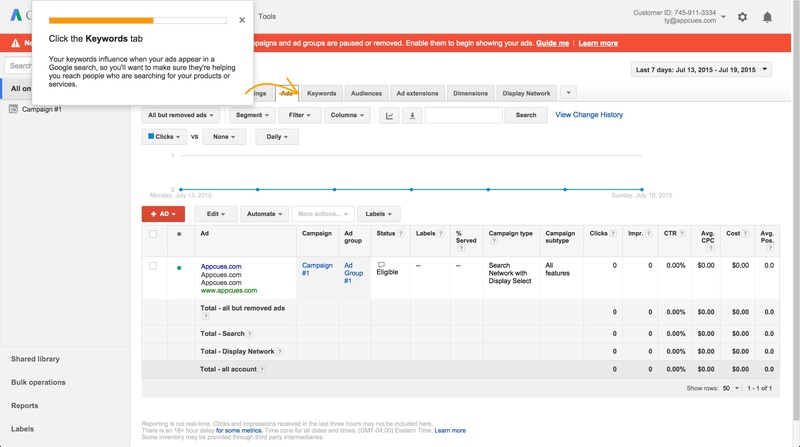 Here are a few ways Google increases user engagement. Now I know this might not seem genius, but this kind of product announcement works. It’s contextual, and it worked on me. 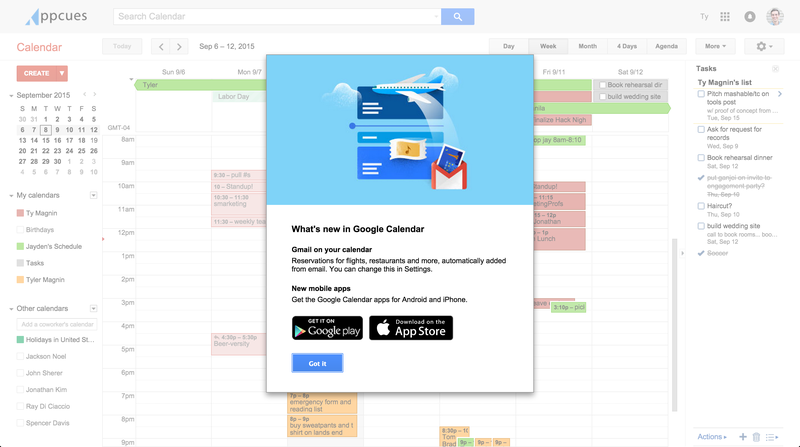 I now favor Google Calendar over my Apple Calendar on my iPhone. Google is also a master at pushing users from a mobile browser-based product experience to their native apps. By downloading a mobile version of a product, users are likely to log in more due to two things: the real estate an app icon takes on a phone, and an increase in engagement from a better product experience. 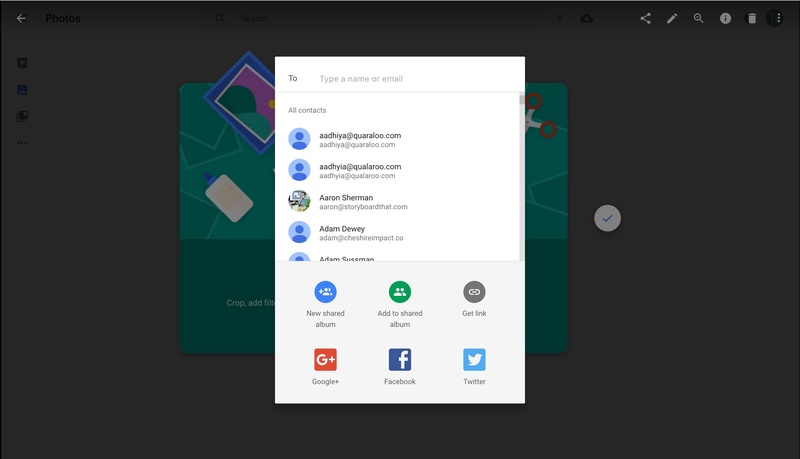 This slideout-style modal that Google uses is an easy, non-intrusive way to entice users to download and start using the better product experience. 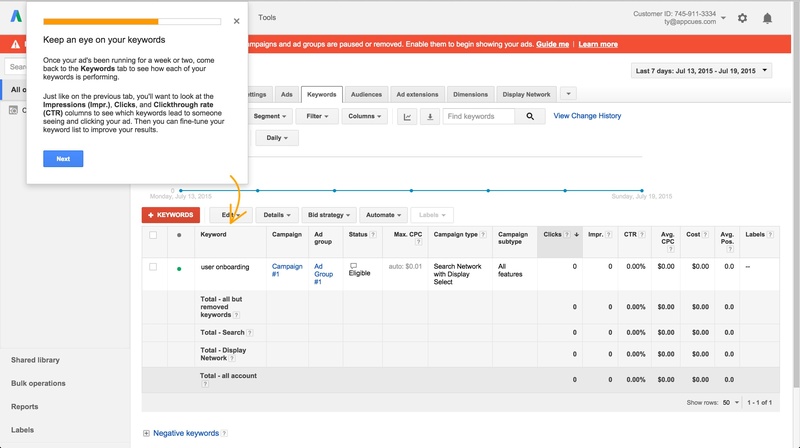 Another way Google increases user engagement is by tightening the integration between their products. Gmail is one of Google’s most popular products. It’s arguably the hub of their business tool suite. 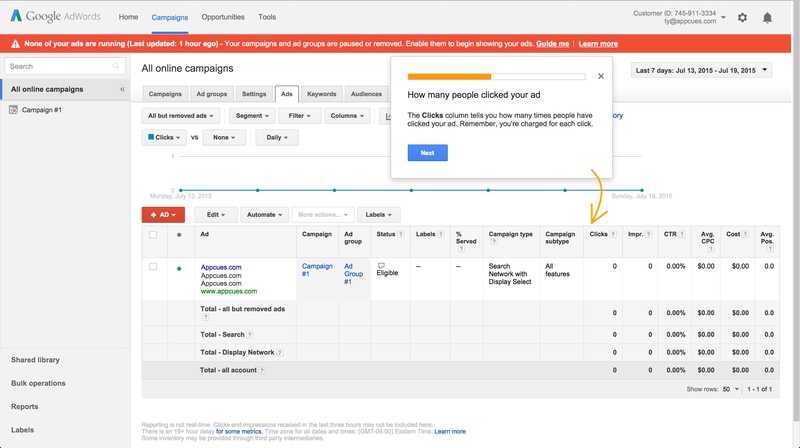 As Google better integrates other products into Gmail, it’s likely that those products see an increase in engagement from their existing users. 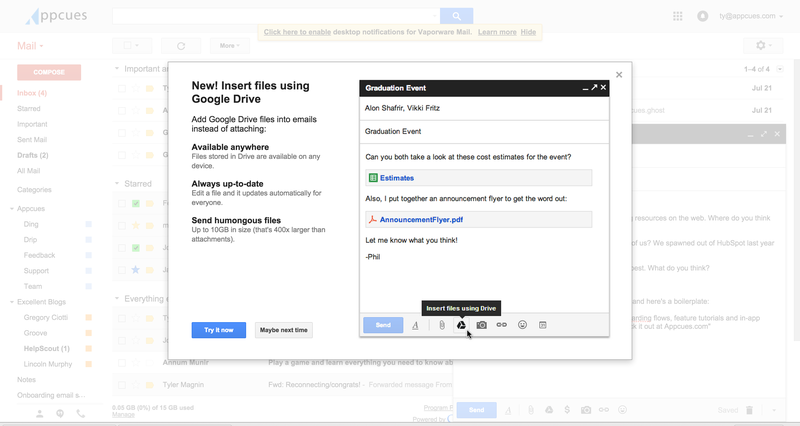 This modal announcement shows Gmail users how easy it is to attach files with Drive. 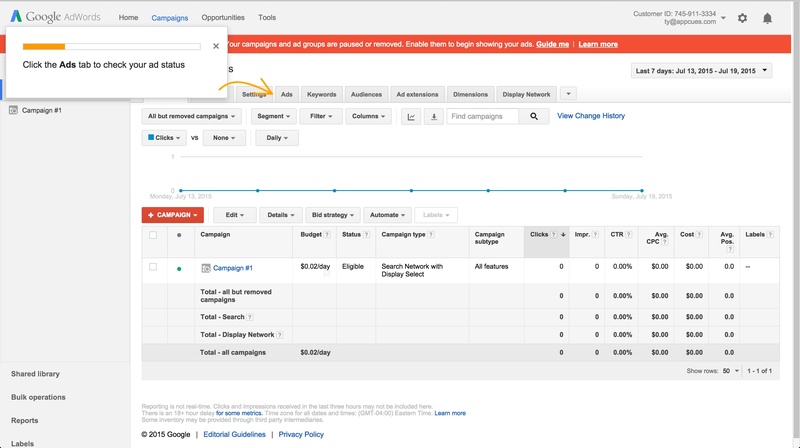 This improvement inevitably increases engagement to Drive for Gmail. You can even see how Google is now packaging these products together as a single entity with G Suite. User adoption can apply to a feature or feature set or to new users adopting a product generally. Although those instances may seem different, there’s a lot in common with the way users are introduced to a new feature and the way they are onboarded to a product. This tour serves to educate new users on a rather complicated product. 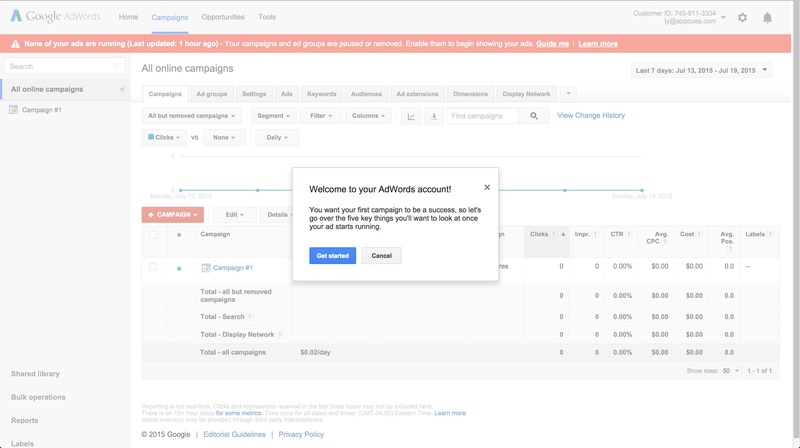 It’s aim is to mitigate initial friction of guessing where to go first for new users, and because it’s been living in AdWords for a while now, it can be interpreted that it successfully increases platform adoption. 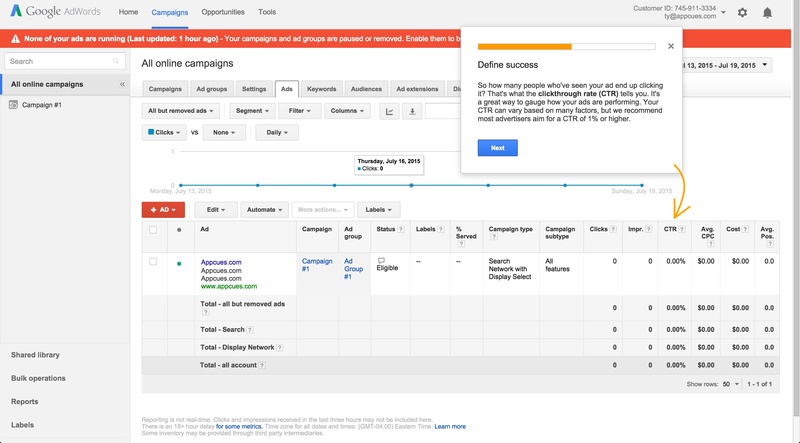 Google increases adoption to new features similarly. 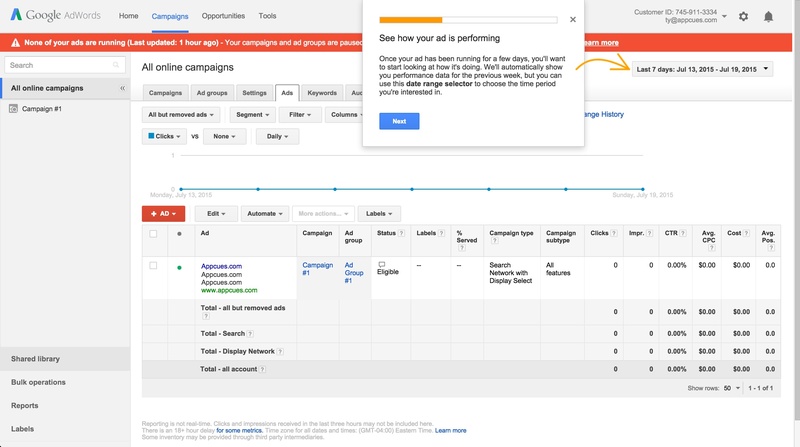 Google uses different kinds of modals—sometimes centered, other times slideouts—to announce new features to existing users. 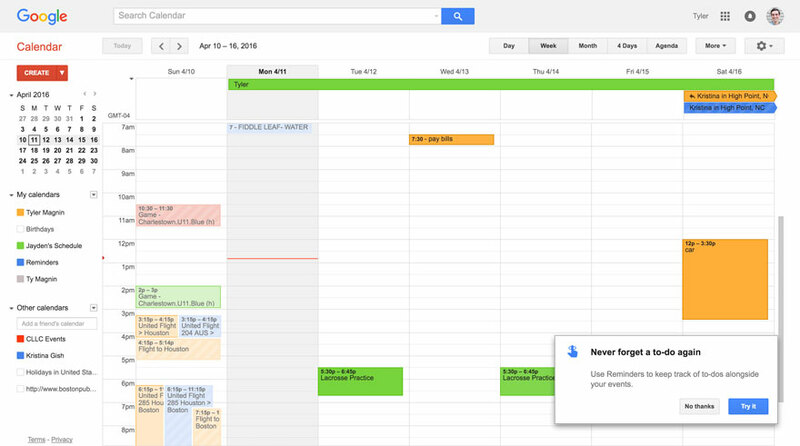 This reminder catches a user’s attention in the place where they are most likely to adopt the new Calendar feature—in the product. We’ve seen this turn flat-lined adoption into a hockey stick growth curve before, so it’s safe to assume it helped Google Calendar increase usage to its Reminders feature. 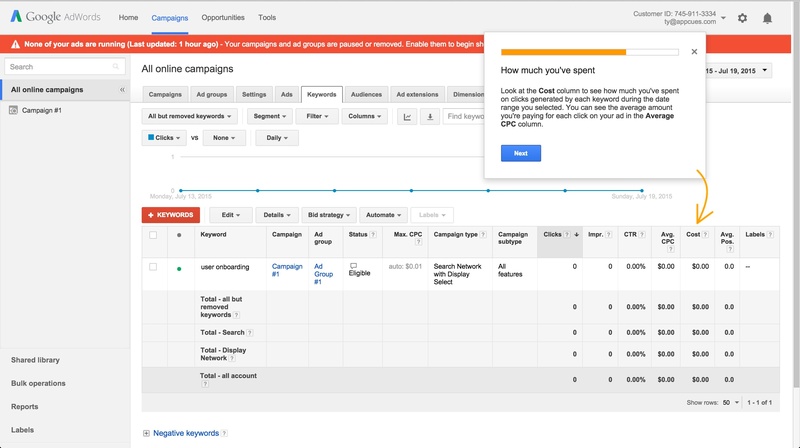 Retention is such an important driver of revenue for software businesses, so it’s no wonder I found examples of retention efforts in Google’s cash cow, AdWords. 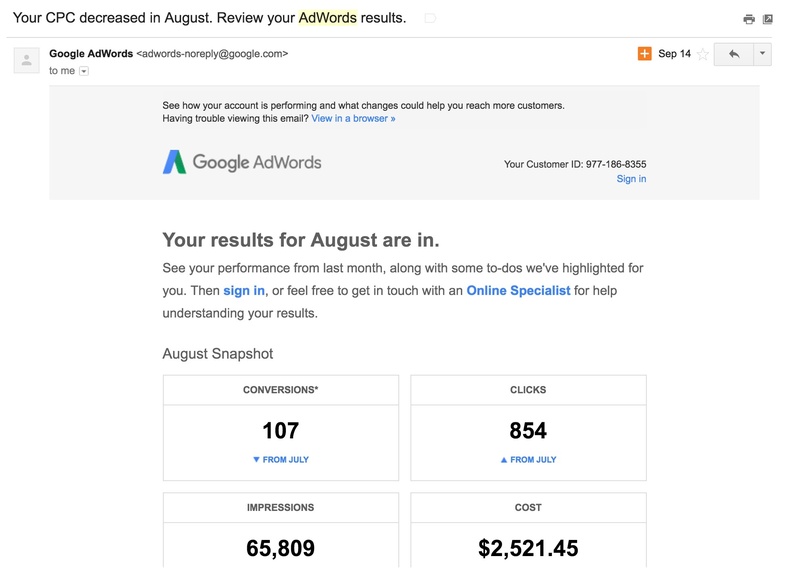 At the most basic level, this email reminds me that AdWords is doing work for me. 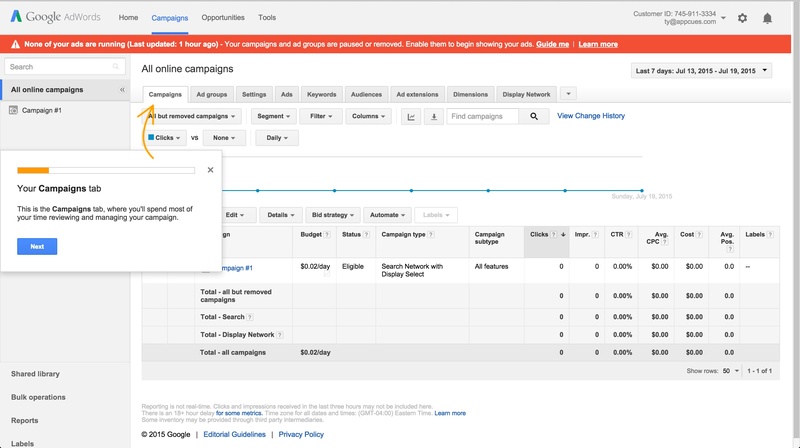 Further though, it helps me recognize trends in the ads performance as well as ROI. This report can help marketers like me sound smart when our boss—who often has the power to shut down spend like this—comes asking about their performance. There are several things a user experience designer can do to increase task success. By enabling and/or surfacing common flows, users can execute faster on a given task. Although efforts to increase task success can be difficult to spot, from my perspective, Google seems to excel at this UX metric too. Their products are efficient. 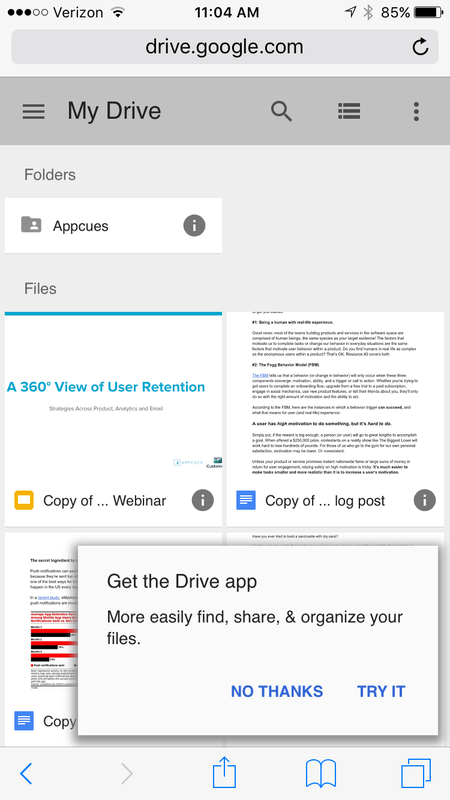 Lucky for you, I did find one example of how Google drives task success. I imagine that Google Photos was seeing a lot of people sending pictures via links or attachments via Gmail. Knowing that this method could be smoother, Google optimized the way that photos hosted in Photos can be sent and shared. 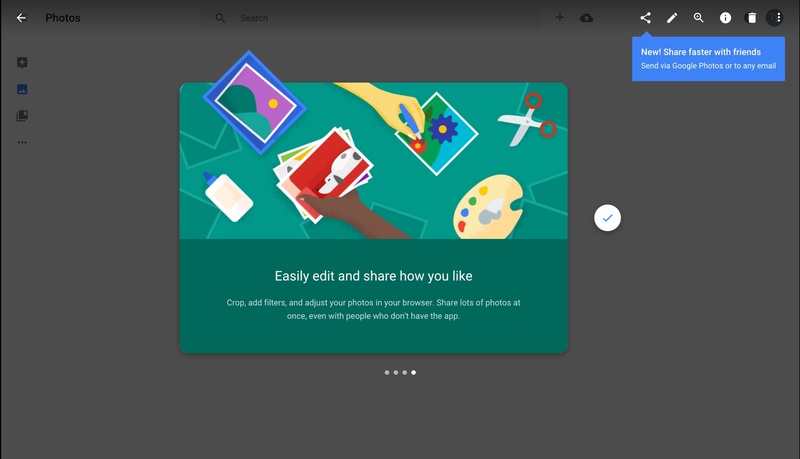 In this example, Google uses a blue tooltip to point the way to a super simple sending window.This effectively eliminates any extraneous steps one might take in sharing photos with friends. Google uses many means of communication. 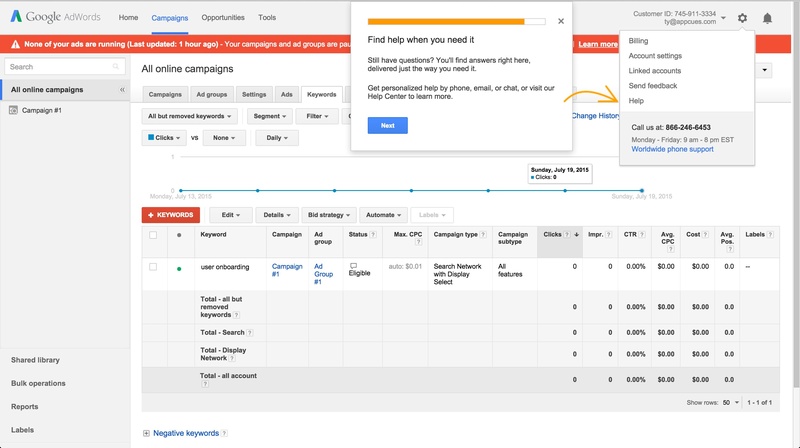 They combine email, feedback forms, tooltips, and modals to increase the HEART of their products and drive more revenue to the 4th most valuable company in the world. I’d highly encourage you to start measuring your user experience with HEART and try some of these methods for improving each metric in your own product. P.S. If you aren’t familiar with Appcues, we can make it easy for you to drive HEART by publishing in-product surveys and experiences to improve user adoption, retention, and engagement. If any of this sounds appealing to you, give us a try.